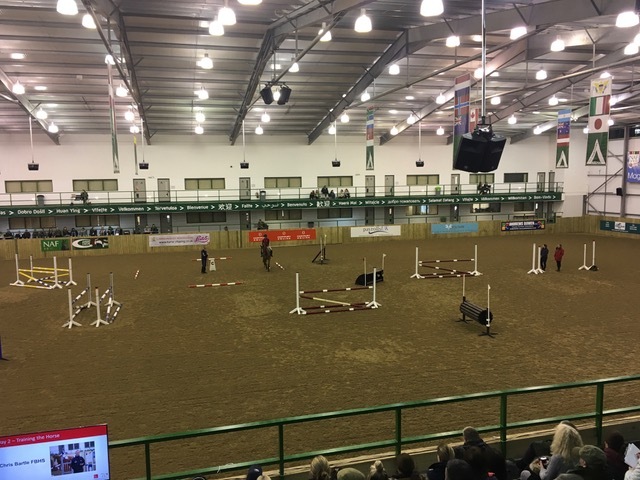 Home › Reports 2018 › BHS International Convention 2018 – Hartpury. BHS International Convention 2018 – Hartpury. This week I was fortunate enough to attend the first two days of the British Horse Society International Convention up at Hartpury. This year the BHS celebrates its 70th Birthday, and what a fantastic job they did producing this Convention. For anyone who missed it, I do urge you to try to go the next one at Myerscough 16-18th April. Inspiring and educational presentations were given by Chris Bartle FBHS and British Eventing Team’s High Performance Coach. He covered Grid sessions, and sessions on training horses to jump technical fences. He paid particular attention to how the rider sits, and how this influences the direction the horse goes. Christoph Hess worked on developing the riders use of the aids to advance the training of the horse. He emphasised how important it is to really have your horse going forwards, especially when doing lateral work. Both Coaches compliment each other and its so interesting to see the follow through from Dressage to Jumping. Riding forwards into a contact was empahsized throughout with both Coaches. Sam York our newest Fellow of the British Horse Society and a Senior Lecturer at Nottingham University, gave two outstanding demonstrations on Equestrian Coaching in the 21st Century. Sam is a great communicator and is passionate about continually learning and embracing modern Coaching techniques. She worked with a rider who wore “special glasses” that then showed us on a screen where the rider looks when they jump. A lot of research has been done on this and it was interesting to observe. On the second day Sam used different jumping exercises and some photo footage, to demonstrate how horses best read different sorts of fences. They haven’t quite invented the glasses for the horse yet!! Sam had two riders taking differing routes to XC type fences, and we were able to observe how quickly the horses locked on. We had a fantastic ridden session given by our BHS Chairman David Sheerin coached by Christoph Hess. David was a pleasure to watch…in complete harmony with his horse. I think Christoph was very impressed that the Chairman of the BHS could ride so well! What an Ambassador for the BHS going forward into the 21st Centuary! Dr Andrew McLean flew in from Australia to give a demonstration on “The Correct Beginnings” He had two of Jennie Loriston Clarke’s young horses to work with. He demonstrated the correct foundations of training the young horse. There was also a talk on the launch of the new Equine Pathway which offers a modern way of assessing riders and grooms, to enable them to achieve “Industry Ready” Qualifications which are fit for purpose. We had a super Gala Dinner at the Hatherley Manor Hotel on Monday night with Guest speaker Bob Champion. The F&I table was a great success, although we did appear to have more empty wine bottles than people! I am so proud to be a part of the BHS and of course the F&I Association!